Updated Statement Friday, June 16, 11:15 a.m.
Misinformation about the dog flu has begun circulating on social media. This web page is the sole official source of accurate dog flu information provided by the UF College of Veterinary Medicine. College officials advise residents to review the FAQs posted below for further information about H3N2 CIV. College veterinarians confirm that 21 dogs in its care have tested positive for the dog flu. These cases have originated in north and central Florida. As many independent veterinarians across the state also are able to provide diagnostic testing for H3N2 CIV, college officials are unable to confirm outside cases. College officials also remain unable to provide specific county information because canine influenza is not among the reportable diseases per state law. Updated Statement Friday, June 2, 2:53 p.m.
UF College of Veterinary Medicine officials confirm cases have originated in north and central Florida but do not have specific county information. Merck Animal Health and Zoetis, makers of the canine influenza vaccine have anticipated additional demand and are increasing vaccine supplies. There have not been any dog flu deaths at the UF Veterinary Hospitals. 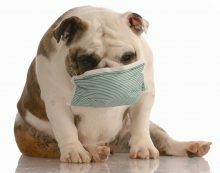 Additional information can be found doginfluenza.com. Updated Statement Thursday, June 1, 2:30 p.m.
Visit the UF Health Facebook page to view the June 1 question and answer session with Cynda Crawford, D.V.M., Ph.D., the Maddie’s Clinical Assistant Professor of Shelter Medicine at the UF College of Veterinary Medicine. Dr. Crawford answered questions concerning the more than one dozen confirmed cases of canine influenza A virus, also known as “dog flu.” Veterinarians in central and north Florida are treating many dogs that are suspected to have dog flu. Updated Statement Wednesday, May 31, 2:33 p.m.
UF College of Veterinary Medicine officials have confirmed more than one dozen cases of canine influenza A virus, a.k.a. “dog flu.” The first 12 dogs tested have been confirmed with the strain of influenza A known as H3N2 CIV. Dogs testing positive for the H3N2 strain were present at recent dog shows in Perry, Georgia or Deland, Florida or were exposed to dogs who were present at these shows. This is the same strain responsible for the severe outbreak of canine influenza in Chicago in 2015.